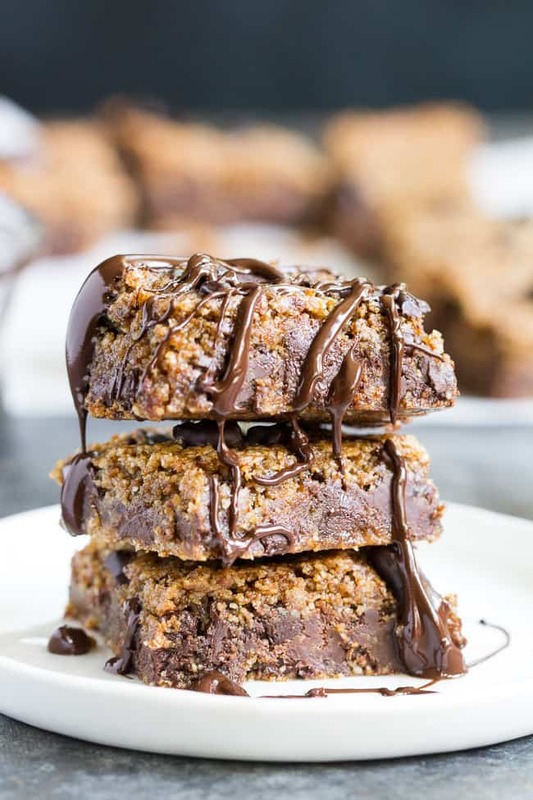 These fudgy chocolate chip blondies are a breeze to make, chewy, chocolatey and just happen to be made with good for you ingredients too! A special gluten free, dairy free, paleo and vegan dessert your whole family will love. Well hello paleo (and maybe vegan) friends! I’m honestly pretty exhausted in the current moment. Not only because it’s 4:30pm on a rainy and coldish Monday, but because I just finished a week of hosting the Whole30 Recipes Instagram account for the first time! 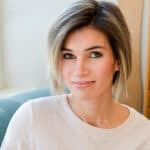 Yes, it was an incredibly rewarding experience to share all my Whole30 favorites and interact with an inspiring community. It also completely took over my life for the last 7 days and I think I’m still coming down from the high. To celebrate? Well, I guess I’ll be celebrating my week hosting Whole30 with a very “life-after-Whole30” recipe – you got it – a chocolatey treat recipe! 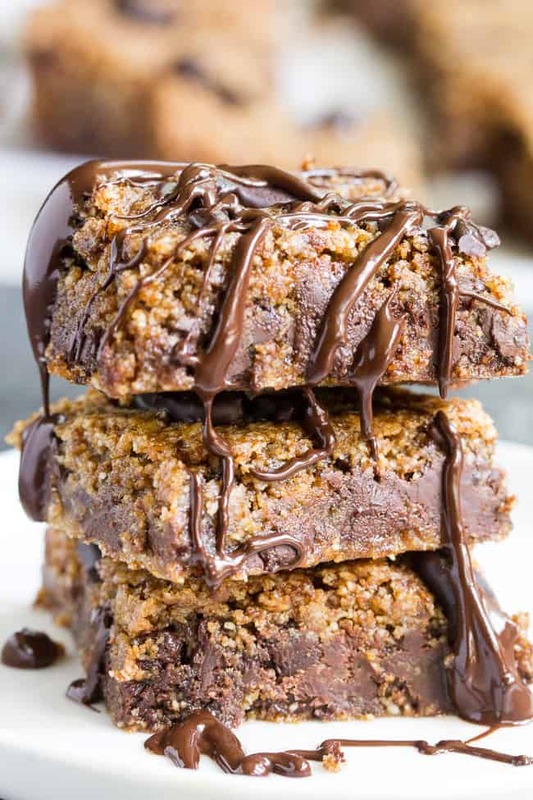 To be precise, we’re making deliciously fudgy paleo and vegan blondies – are you guys with me?! I love blondies – no big news there. Does anybody not love blondies? 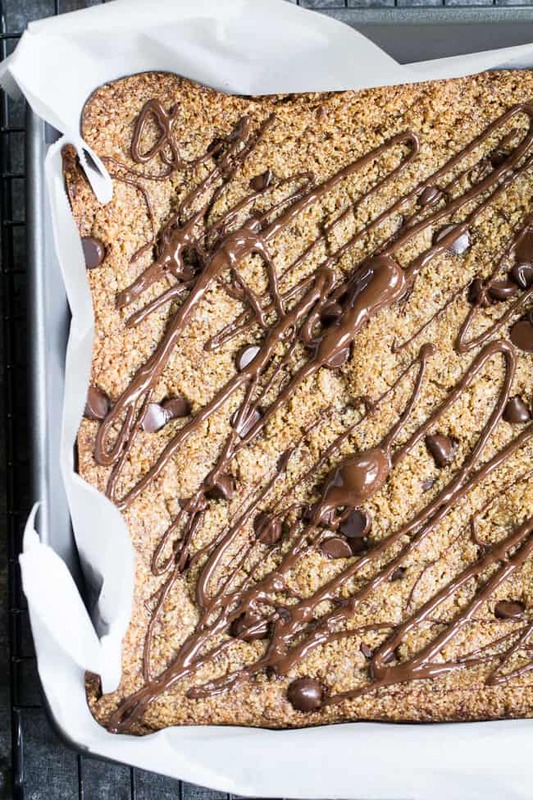 They’re essentially one big gooey chewy fudgy chocolate chip cookie. I’ve made a couple of paleo versions involving nut butter, and trust me, they’re crazy good. To make them vegan, I decided to use a “flax egg” since I’ve had great success with them recently. To create the “egg”, you simply mix 1 Tbsp of ground flaxseed with 2.5 Tbsp water (room temp) and allow it to sit for 10-15 mins. Like magic, when the time is up the mixture has the consistency of a raw egg – cool stuff, right? 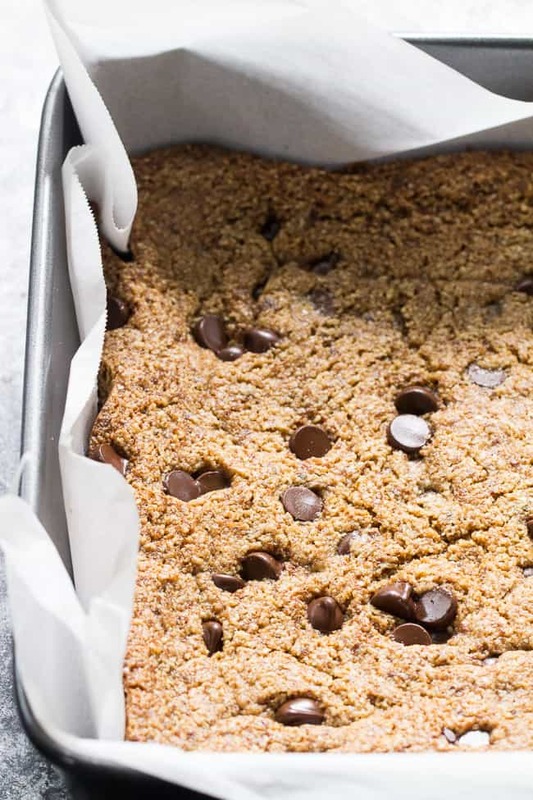 It doesn’t change the flavor of the blondies and creates a dense chewy texture. I actually find it similar to using 1 egg yolk, rather than 1 whole egg. For a paleo version of the recipe using an egg, 1 egg Should give you the best result, however I highly recommend trying these with the flax egg! *If you’re set on using an egg, prepare to decrease the baking time by at least 5 minutes. I decided to go a bit wild with the chocolate in case you couldn’t tell! 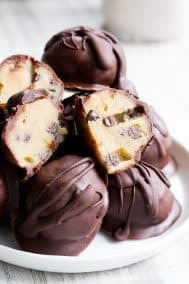 If you don’t mind cane sugar in your chocolate chips, the Enjoy Life dark chocolate morsels are wonderful in this recipe. They’re dairy and soy free and allergy friendly. If you’d rather have a true paleo chocolate, you can make these homemade dark chocolate chunks from Bakerita. They’re sweetened with pure maple syrup and can be used in most recipes where chocolate chips are called for. There’s really no need to make them even more decadent, but, if you’re in that sort of chocolate craving mood, you can even drizzle more melted dark chocolate over the top, and for a truly decadent dessert, a scoop of my homemade vegan vanilla bean ice cream (in the photo!) would be amazing. I hope you’re all ready to bake something incredibly yummy! Let’s get started! Prepare the flax egg as described above, begin to prepare the batter while waiting. Blend together coconut oil and coconut sugar using an electric hand mixer, then vanilla and sea salt until smooth. Beat in flax egg until smooth, then stir in dry ingredients. Beat with a wooden spoon for another minutes, then fold in 3/4 cup chocolate chips/chunks. Transfer to prepared baking dish and sprinkle remaining chocolate chips over the top. Bake in the preheated oven for 18-22 minutes until browning around the edges - it will look very soft but will firm up while cooling. Cool completely on a wire rack, and refrigerate prior to cutting. I prefer these stored in the refrigerator due to the coconut oil content - you can bring them back to room temp before serving. Makes 16 blondies. 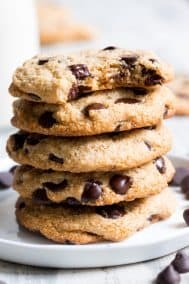 *You can purchase dairy and soy free chocolate chips here, or make your own paleo version using this recipe. 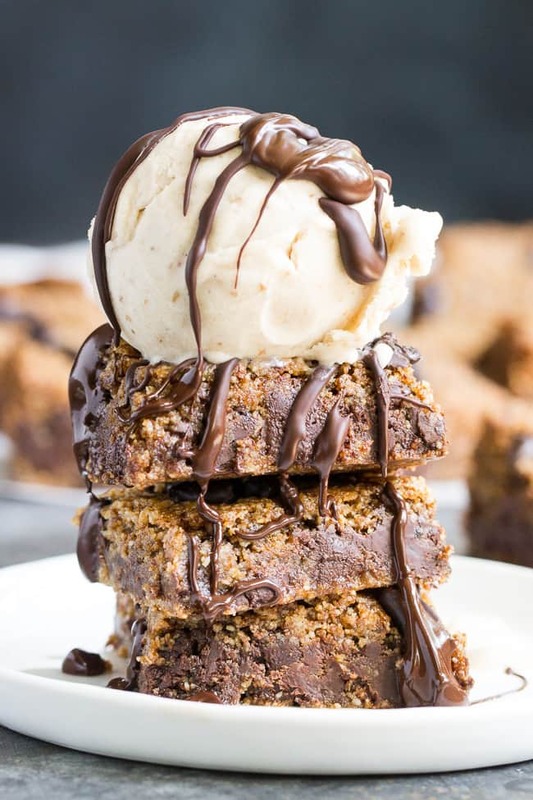 Want more delicious paleo and vegan dessert recipes? Try one of these! Have you made your own paleo chocolate yet? 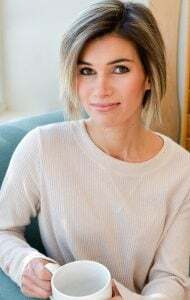 Can you use an egg in place of the flaxseed? Oh my goodness, yum! Thanks for making these without nut butter – I love that idea! I’ve made paleo chocolate with cocoa butter and cocoa powder, and it turned out great! It was super dark, but I’m okay with that 😉 I’ll have to try these soon; thanks for sharing! Haha, that makes sense! Cocoa butter is so finicky! I actually got the idea from the Paleo Chocolate Lover’s Cookbook by Kelly Brozyna (The Spunky Coconut). I’ve made the chocolate both sweetened and unsweetened, and I like it both ways! Coconut oil chocolate is the bomb too, though! Can I use non-refined coconut oil? That is only type I buy. Could you use something else for the coconut oil and coconut sugar? I’ve been searching for a ‘blond’ brownie as I can’t have chocolate. Excited to see these, but also can’t have coconut. Hi! I think you could sub palm oil shortening for the coconut oil, or pastured butter if you don’t need vegan or paleo. And for the coconut sugar, maple sugar usually subs in really well. Hope this helps! What is a good substitute for the almond flour? Unfortunately I have a ton of allergies including almonds. 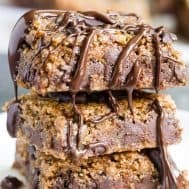 Any other nut flour would work (hazelnut, if that’s possible) otherwise using a different flour such as coconut would change too many other ingredients to give an accurate answer here. Sorry! I’m unable to eat almond flour because of the high FODMAP content. 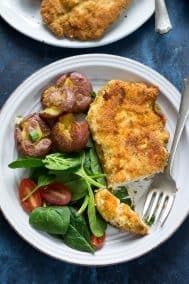 Could I substitute coconut flour? Coconut flour is so different from almond flour so I’m thinking unfortunately no. Coconut flour also needs eggs for it to work properly, so that’s an issue as well. If you wanted to try to work with it, I’d use 2 eggs and just 2/3 cup of coconut flour. The consistency will be different though this way. I made these using the egg yolk version. We thought they were rather dry. Would the flax egg make them more fuggy? I did like the flavor of them. I baked them the 22 minutes as stated. I have a feeling maybe a whole egg was needed the flax egg version was definitely gooey, I also wonder if the baking time would need to be adjusted. Hi! I made these tonight, and added a peanut butter drizzle just because (…!) I bought flax seeds to use, but didn’t buy the already ground ones (my mistake I’ve never used them before) so the flax eggs were a fail 🙁 I used 1 egg yolk instead. And if I were to make them again I think I would cook them for a slightly shorter time! Maybe 16-18 minutes. 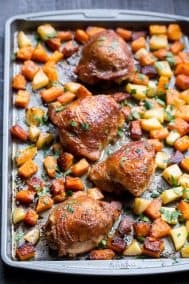 I’ve got the leftover ingredients and the pan of this batch is now half gone sooooo looks like I might try the shorter cook time instead later this weekend 🙂 Thank you for a great recipe! Glad it worked out with the egg yolk! I definitely think baking time needs to be adjusted with the egg since they cook faster. I think a whole egg would probably be just fine too ? So! I made these again today to use up the rest of the blanched almond flour (because, you know, it would go bad just sitting in the fridge all on its lonesome). Used one whole egg, and adjusted the cook time to 15 minutes. Perfection! Topped with homemade melted paleo choc and a peanut butter drizzle (pb mixed with coconut oil and a dash of maple syrup, I know it’s not paleo but I think an almond butter drizzle could be nice too!) I sprinkled it all with a bit of salt. Thank you for this recipe!! It will be a regular on the rotation for sure. 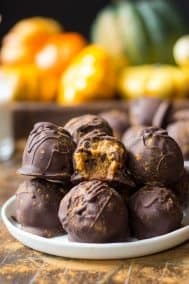 These are gorgeous Michele; I love how you had the challenge of not using any nut butter. It looks like they turned out delicious. Since I’m not paleo I’ll probably use regular chocolate chips. Pinning to try later today, hopefully or tomorrow! 🙂 And I’m so glad you got to host the Whole 30 Account; that’s a wonderful opportunity. 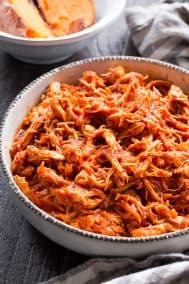 Our family just started following the Paleo diet about 3 weeks ago and I keep returning to your website for more of your great recipes! 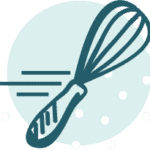 I’m a recipe follower, not one to experiment, and appreciate everything from your detailed instructions to your suggested products. I’m learning, and with your help, my family is enjoying some fabulous meals… and desserts. 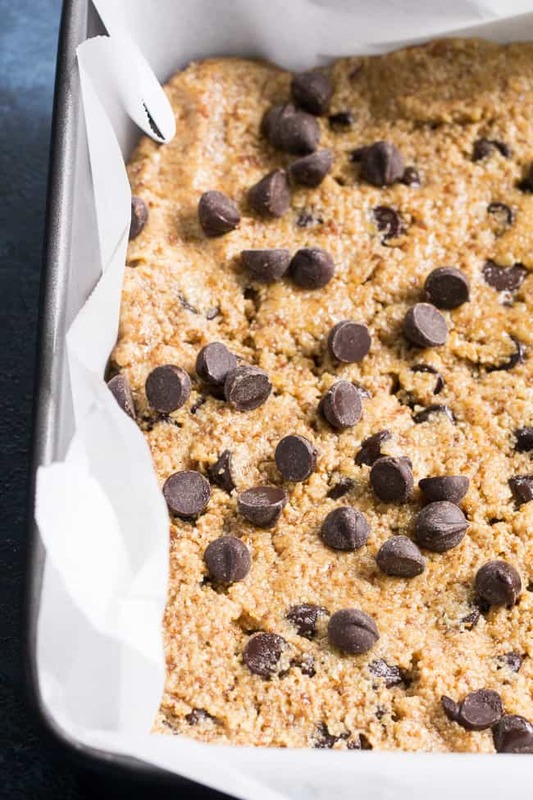 These chocolate chip blondies were super easy to make and are delicious!!! Okay, these are amazing! I like coconut but I’ve found there to be too much coconut flavor in most paleo baked goods. I realized too late that I didn’t have enough coconut oil so I used half coconut oil, half ghee and used an egg. I underbaked mine a little (by accident) but they are fudgy, slightly salty and delicious! This is my new go-to. Thanks for coming up with this great recipe! 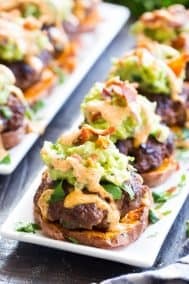 I made these for The Super Bowl and they were awesome! So gooey and delicious! Can’t wait to make them again. I used a real egg and baked for 15 minutes and they were perfect! Thanks for another great recipe! Absolutely delicious!! I made these tonight for my family and I honestly keep thinking one of these recipes from this site is sure to not turn out. So far they just keep getting better. These are really so good!! No one would ever know they are vegan dairy and gluten free. I feel great being able to give my family a dessert that I can feel good about serving. Thank you!! Do you think these would freeze well? Look so yummy! Hi just wondering how many eggs would you use in place of the flax eggs? My first time doing a recipe with a flax egg!My husband and I both loved these. This will be my Goto recipe for Blondies from now on! 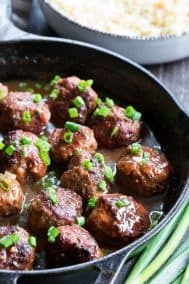 can I use maple syrup in this recipe?